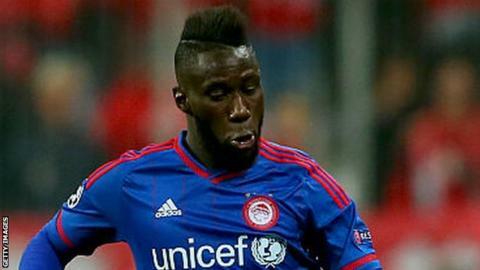 West Ham have signed French left-back Arthur Masuaku from Olympiakos on a four-year contract. The former France Under-19 player, 22, began his career with Valenciennes before joining Olympiakos in 2014. He won back-to-back domestic titles in playing more than 100 times for the Greek side, including 12 appearances in the Champions League. West Ham targeted a left-back after Aaron Cresswell was ruled out for up to four months with a knee injury. Masuaku, who will wear the number 26 shirt, made his international debut alongside Paul Pogba for the French Under-18 side in 2011. During his time in Ligue 1 he played against West Ham's former Marseille forward Dimitri Payet. "I was speaking with my agent about some opportunities, but when he told me about West Ham and also the coach, I didn't think twice," Masuaku told the West Ham website. "For me, the Premier League is the biggest league in the world. When I was 18, my target was to come here, so now I am here, I have to prove myself to the fans and to the team."